If only Aberdeen had one of these fun, and at times scary, ghost buses. 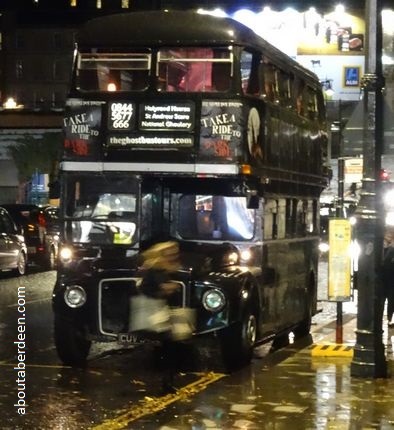 We thoroughly recommend anyone visiting Edinburgh to go along in the evening to Waverley Bridge where this old black routemaster, that was used to take the coffin and bereaved families and friends to the cemeteries, awaits. 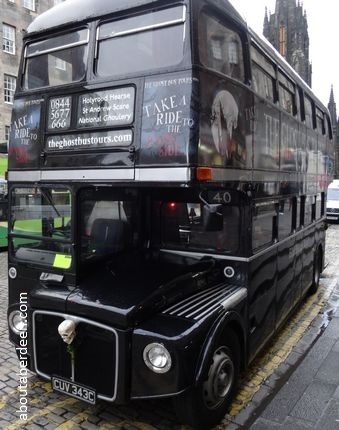 Tours start at 1930 hours and if you find yourself at the Royal Mile during the day you can see the bus and staff and pre-book tickets or get a leaflet which usually has a discount code or offer such as a free guide book. Do enter into the spirit of the occasion and take part in the theatrics that starts with meeting the charismatic conductor in period costume complete with waxed moustache. As you can see from our Edinburgh Ghost Bus Tour reviews page we chose to sit downstairs next to a previous passenger! Allow about an hour and 30 minutes to enjoy this macabre experience. The conductor runs between the top and bottom deck, scaring the life out of his passengers in an amusing way as the driver guides the ghost bus through the streets of Edinburgh. Stops include a nocturnal visit to a graveyard to learn about body snatching, the Castle, Grassmarket, the New and Old Town, Greyfriar's Kirk and Holyrood Palace. Expect lots of surprises, sound and visual effects and a great entertaining bus ride as you learn about the grisly side of Auld Reeky. This includes ghost stories, murder tales and how executions and torture was performed.